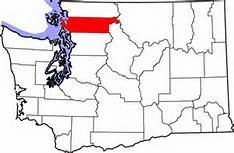 Skagit (SKAD-jit) is the name of a group of Coast Salish Peoples who once thrived in northwestern Washington. In Skagit County, the Skagit River runs through Skagit Valley emptying its waters into Skagit Bay. How do I get to your area? Driving from Seattle or Bellingham/Vancouver to Anacortes: I5 – Exit 230 – SR20 West – Anacortes. Driving from Seattle or Bellingham/Vancouver to Mount Vernon: I5 – Exit 226. Enjoy a night’s stay at the Wild Iris Inn in La Conner, the Majestic Inn in Anacortes, the Tulip Inn in Mount Vernon, the Hampton Inn Suites in Burlington or the many other hotels, motels, bed & breakfasts and Airbnbs in these towns. Looking for a farmstay? Check out Blanchard Mountain Farm Guest House in Bow (outside our free pickup area). Where can I get picked up & dropped off? 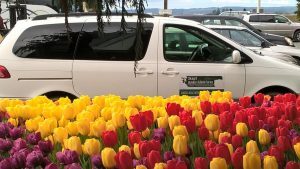 Pick-up & drop-off locations include: hotels, motels, B&Bs, AirBnBs, marinas and residences in Anacortes & La Conner, Anacortes & Bellingham Ferry Docks, Anacortes & Burlington Airporter Shuttle locations, and Mount Vernon & Bellingham Amtrak Stations. Fee may apply for some locations; please inquire. Pick-up times will be arranged 48 hrs prior to Adventure, via phone or email. Who will my Adventure Guide be? What I’ve come to enjoy most as an Adventure Guide is watching people be amazed and touched by nature. Seeing their eyes and spirit glow from that connection is priceless! In Texas, I taught kids at sea camps and led kayaking & birding tours around the bay’s marshy habitat and coastal beaches. In the Florida Keys, I took kids & elderhostels exploring in the fun coral reefs, sea-grass beds and mangroves. In Cancun, I led eco-tours around the Yucatan Peninsula. In Baja, I guided birding, snorkeling, kayaking, hiking and gray whale watching expeditions. In Hawaii, I narrated on whale watching boats for 10 years. In Churchill (Canada), I led polar bear and beluga whale watching tours. In Southeast Alaska, I guided whale watching, birding, kayaking, fishing and hiking trips from adventure cruises for 10 years. My latest adventure began in 2010 after this Mexico City native fell in love with the amazingly beautiful and diverse environment of NW Washington, and in particular Skagit County with its islands, coastline, waterside towns, farmlands, mountains, forest, wildlife, wildflowers and wilderness. So now, I invite you to “Re-Wild Your Spirit!” on any of the Adventures I designed. Why a small group size? A small group, of up to 6 Adventurers, gives you a more intimate connection with nature, a more personalized service from your Adventure Guide, flexibility to modify the itinerary to accommodate your particular interests, and minimizes your impact on the environment. What type of vehicle will I be riding in? A clean and comfortable Toyota minivan, co-piloted by Sebastian. Call/email us to get an updated weather forecast for your Adventure area. Subject matters include: the natural & cultural history, geology, marine and terrestrial habitats, flora and fauna, and the “nowadays ways of life” of NW Washington depending on the Adventure and your curiosity. Adventures are booked on a first come first served basis. As soon as one is booked, others listed on the same day will be cancelled. If you don’t see your Adventure listed on a particular day, check for alternate dates in the Calendar. Re-scheduling an Adventure incurs a $25 fee. 2 days: will forfeit 100%. SGA will use those funds to sponsor a low-income Latino Family Adventure. 7 days: will be refunded 50% – $25 cancellation fee. SGA will use those funds to sponsor a low-income Latino Family Adventure. 8 days or longer: will be refunded 100% – $25 cancellation fee. If Skagit Guided Adventures cancels the tour and if your Adventure cannot be re-scheduled, you will be refunded 100%. Skagit Guided Adventures reserves the right to substitute, modify or terminate the tour if weather or other unforeseen circumstances compromise the safety of the group. Can I charter an Adventure? Do you offer Guided Adventures in any other language? Yes, all Adventures can be guided in Spanish. Hablo Espanol! 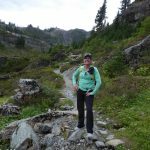 How can I explore Mt Rainier and Olympic National Parks?